I have been practicing law for almost 20 years now. I really enjoy it. In fact, I like practicing law so much that I continue doing it despite owning several companies that could easily occupy all of my time. In the 20 years I have been practicing law, I have learned some easy tactical methods that you can use to increase your business; however, strategically the most important thing that you can do is to be passionate about what you are doing. Tactics (which I am going to teach you) can work wonders and can be taught. Strategy (which is how you think and feel about your work) cannot be taught. The more you enjoy and are passionate about your work, the more clients you will have. and dream about doing more and more of it. One of the wealthiest attorneys I have ever known represented clients who had sustained injuries in motorcycle accidents. He joined biker groups, fixed his motorcycles in his garage in his free time, gave speeches around the country, lobbied with various political groups about motorcycle-related laws, read all of the motorcycle magazines and contributed to various motorcycle causes. He loved motorcycles and motorcycle law. When I have spoken to other attorneys about this particular attorney, many have said stuff like: "But that does not apply to me, I'm a corporate attorney [or trust and estates, or tax, or patent, etc.]. Are you kidding? It applies to every attorney. I have written books about SEO and have done SEO-related work for thousands of people. What I can tell you is this: The most important component of SEO is being passionate enough to get information out there that people will talk about. Nothing else really matters. In the online world, you need to contribute like hell. You need to get out there and give people everything you've got with videos, articles, forum comments and blogs. You cannot be phony. You need to be yourself and give others everything you can. It is that simple. You need to give and not take. The single biggest thing you can do to impact search engines and your rankings is to contribute and make your material available to the best of your ability. This is how the best attorneys get more clients than they can handle strategically. 1. Get Listed in Directories. Directories are extremely important for attorneys interested in getting business. Directories will come up in various search engines when people are looking for an attorney. The more directories you are in, the better. The keywords you use to describe yourself are also very important. There are tons of directories out there already with new ones being developed all the time. Thus, it is important to keep up with submitting yourself to directories. Submits you to new directories (in addition to Law.net) each month. Increases your social shares and other signals each month (something search engines use to rank attorneys) to help increase the odds you will be found. Gives you a priority listing on Law.net. This will make you come up at the top of Law.net listings when people search for attorneys on our site. Every attorney needs to get their name out to directories and build new directory profiles each month. Search engines are also unpredictable. One day your directory listing may rank highly, and the next day it may not. Being on multiple directories ensures that you are consistently showing up near the top of the search engine results. "Injured by defective Kawasaki motorcycle"
"Los Angeles attorney for motorcycle injuries-Kawasaki"
This strategy is extremely effective and can attract the exact clients many attorneys are seeking. This strategy is very inexpensive and is something that is beneficial for all law firms. In some cases, exit pop ups can increase your leads by 10x or more. If someone is on your website, the odds are very good they have an interest in what you are offering. You need to capture their information at all costs so you can follow up. The average mesotheliomalead, for example, is often worth thousands of dollars. Why would you allow someone to come to your site and not collect their information? This would be insane! Some clients who find you online may increase your revenue by tens of thousands of dollars per year. Why on earth would you let them slip through your hands? 4. Offer Free Information. As an attorney, it is important that you offer free information. When you are offering to give someone something for free, they are much more likely to provide you with their contact information. When you request their personal information, you are essentially making a trade: If you (a) give me your contact information, I will (b) give you something cool for free. 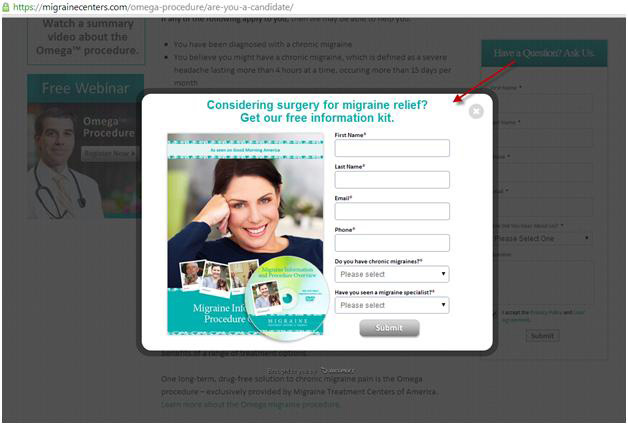 The site above is for people suffering from migraine headaches. 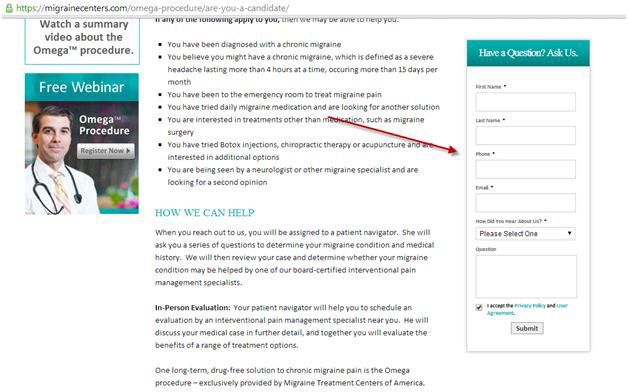 For this group of doctors, patients experiencing migraine headache pain probably represent a huge profit potential. They utilize different tactics to obtain the person's contact information. There is also an additional point. When you offer people something for free, you are setting up reciprocity. This means that these people will appreciate what you gave them, and want to give you something in return. Think about an example of a door-to-door vacuum cleaner salesman. He comes in and cleans for free. Why? Because once he cleans someone's carpet, that person will feel obligated to purchase from him. Think about the Hare Krishna's handing out flowers and then asking for donations. This organization grew to prominence in the United States largely by giving something nice and then receiving a donation in return. 5. Display Your Phone Number on Every Page of Your Website. Remember: It is all about capturing information. In my experience, the best clients call. I suspect this is because they are past the "shopping stage" and are seriously "ready to buy" an attorney. They believe they have an important matter and are taking action. They show search engines you exist. The more activity search engines see surrounding your name, the more prominent they think you are in your geographic area and in the subject matter you are involved with. Once search engines start seeing all of this activity, they believe you are important and influential, and they start sending users your way. Search engines like to see activity surrounding something before they raise your rankings. Reviews do this. They reassure potential clients. When you have [positive] reviews, potential clients are generally reassured that you are a good attorney and must be doing something right. People choose attorneys, doctors and other professionals based on what is being said about them. You want people to be saying good things about you online. Unlike an automobile or other "product", a service is intangible, and people can generally only understand the true quality of a doctor, lawyer, dentist or other service provider by what others say about the person. Therefore, it is important to get positive reviews. The best source of positive reviews is your current and former clients. Another good source of reviews can often be friends or family members for whom you worked on various matters (informally or otherwise). Some good sites to add online reviews to (because Google seems to like them) are Law.net, MerchantCircle.com, Yahoo.com, Kudzu.com and InsiderPages.com. 7. Create Great Articles and Other Content. This is an extremely easy way to get clients. You can put this content either on your site, on a blog on your site, or submit it to local newspapers, bar journals, online legal publications and others. The content you write should generally talk about an area of law not many people are familiar with and your experience in that arena. I have received calls from attorneys, general counsel and others from all over the country due to articles I have written about cases I have been involved in. If you are writing about a niche topic related to mortgage-backed securities, you may be the only one writing about this topic. When someone searches for these terms, your article may come up. If a client needs assistance in this niche, you will appear to be the logical choice. If you write about strategies for recovering attorneys' fees in anti-slap cases, you are likely to be the only attorney writing about this subject. I speak with attorneys all of the time about the importance of writing articles and other information. Many claim they do not have the time. If you do not have the time, you should make the time, and if you cannot make the time, then have someone else do it for you. 8. Syndicate Your Content to Social Media Sites. All of the content you do should be syndicated to social media sites. This will generate back links to your site and also shows search engines that you are an active contributor in your niche. If you have a blog on your site, there are many plugins you can use to have your articles and content automatically distributed to social media sites. 9. Social Media Icons are Needed on Every Page of Your Site and All of your Articles. Installing the social sharing icons, like you see below, on every page of your site is important. When people are sharing the content that you produce, they are typically showing it to people who could benefit from reading your article. The people who receive this content then become potential clients. You need to make sure that all of your content is shareable. Over time, search engines also see the content that is most shared. Content that is shared more often is likely to rank higher in the search engine results. If you are interested in installing sharing icons on your site, please check out Law.net's Concierge Services. We can also help increase the number of your shares as well. 10. Use Sponsorship and Online Advertising. Sponsorship is quite simple. If there is an organization that caters to the people you want as clients, then sponsoring the organization is a great idea. You can do this relatively inexpensively, and sponsorship often results in many recommendations and referrals. In addition, when you sponsor a given organization, you can mention this fact on your website, and this will give you further credibility with clients. I know attorneys who are making millions of dollars a year from pay-per-click advertisements on Google. This works. Pay-per-click can be implemented quickly, and you can benefit from this advertising almost immediately. 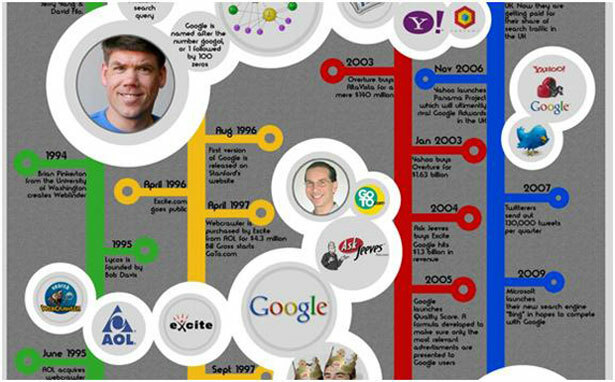 Pay-per-click has largely replaced the printed Yellow Pages as the best way to get business. Marketing yourself properly online is absolutely crucial to getting business for attorneys. You need to do everything you can to promote your services and your firm. Even an attorney who bills out at $500+ an hour is likely to find their value increases when they begin promoting themselves online. This is something you should consistently do to increase your bottom line. Finally, at Law.net, we would love to help you out with any of your online marketing and SEO needs!